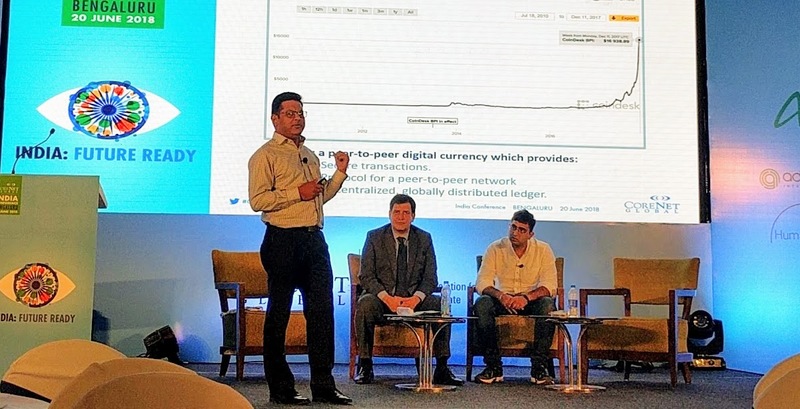 There was a lively discussion going on at the CoreNet Global’s fifth technical conference in Bengaluru on Wednesday, but at the seminar titled Blockchain and Real Estate, every single panellist was sure about one thing. That whatever the use case, blockchain brought security, privacy and decentralisation for the users at both ends. The panel discussion was attended by Mridul Mishra, senior director at Fidelity Investments, Kushagra Singh, blockchain consultant at Neptune Blockchain and Amit Oberoi, executive director at Colliers International. Oberoi began the conversation by the cheeky (but true) statement, “Blockchain technology can be applied to any and every sector — from agriculture to online dating.” Explaining that one of the key advantages of the technology which was invented in the early ’90s, is transparency. Showing the audience an old-fashioned ledger, replete with smudges and wobbly handwriting, Oberoi said that this was the oldest version of blockchain known to mankind. The three industry leaders also discussed how the Maharashtra, Telangana, Andhra Pradesh and West Bengal are in the process of using blockchain technology to store and detangle land records. Mishra, who gave the audience a bit of background for the talk, said that government initiatives such as Aadhaar and UIDAI could benefit a lot from blockchain technology. “No one person owns the information, but enough persons own it to make everyone feel safe,” he said. Though most of the panellists were enthusiastic about new tech, especially blockchain, most of them agreed that it was a little too soon for India — especially the public sector — to be optimistic about its use on ground level. The panellists said that government has been overly optimistic about blockchain. They wanted to use it for fixing land records, and other big projects, but they are “setting themselves up for disillusionment,” was a common thought. They added that blockchain in India needed the right support from people as well as a proper structure to settle itself as a prime technology in the upcoming years. The CoreNet Global witnessed 300 business leaders and industry experts across the industry. They discussed the development in the real estate sector with technology as well as the positive impact it has made in finance and manufacturing sectors. The event saw R Chandrasekhar, former president of NASSCOM and an IT specialist, delivering the keynote address.